Mr. McCain quietly declared before his death that he did not want Mr. Trump to take part in his funeral. Confidants of Sen. John McCain, R-Ariz., told the White House that President Trump won’t be invited to the ailing senator’s funeral according to a new report. Plans for McCain’s funeral, according to the New York Times, include an invite for Vice President Mike Pence, but not the president. The service will be held at Washington’s National Cathedral. Trump and McCain have had an embattled relationship during the president’s time in the White House. Today President Trump decided that he will not attend the funeral for Sen. John McCain (R-Ariz.), who died Saturday after a battle with brain cancer, a spokesperson for McCain confirmed to the Washington Post on Monday. In its morning news reports about Sen. McCain, CNN broadcasted a headline graphic saying that Mrs. Trump will not attend the funeral services. Questions about whether the first lady would be among the mourners honoring Sen. McCain started after The New York Times reported that initial plans indicated that “Vice President Mike Pence was to attend, but not President Trump,” who has publicly disparaged Sen. McCain on numerous occasions. In May Melania traveled to Houston for the funeral of former first lady Barbara Bush, which Mr. Trump did not attend. 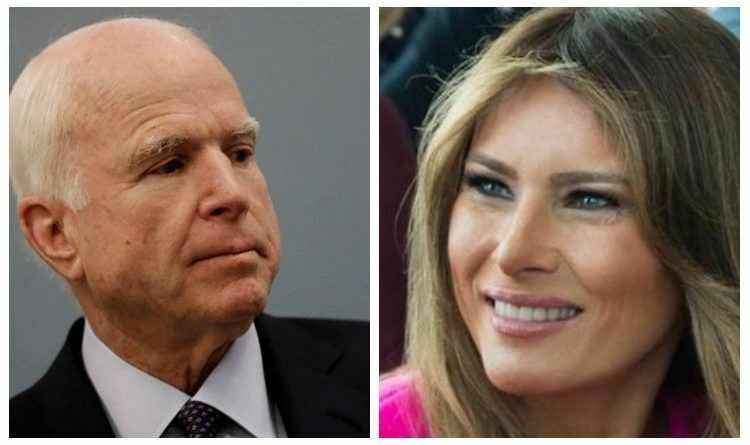 So what do you think should Melania attend McCain’s funeral? Democrat Supporter Arrested After Trying To Run Over GOP Campaign Worker!